According to the document, information from the the so-called Steele dossier was "essential" to the acquisition of surveillance warrants on Trump campaign aide Carter Page. It claims that then-deputy FBI director Andrew McCabe told the committee in December that without the information from the Steele dossier, no surveillance warrant for Page would have been sought. The document claims that although the FBI had "clear evidence" that the author of the dossier, former British spy Christopher Steele, was biased against Trump, it did not convey that to the surveillance court when making its warrant applications. Steele told then-associate deputy attorney general Bruce Ohr that he was "desperate that Donald Trump not get elected and was passionate about him not being president," the memo says. House conservatives have touted the memo's revelations as “worse than Watergate” and hinted that it could prove the undoing of the federal investigation into Trump’s campaign. Meanwhile, Democrats on the panel say that it is a cherry-picked set of inaccurate accusations designed to kneecap special counsel Robert Mueller. They have drafted their own counter-memo to rebut the Republican-drafted document, but the majority voted against immediately making that document public earlier this week. As The Hill reported earlier, ahead of the document's release, Paul Ryan privately urged House Republicans not to overplay the document — and not to tie it to the Mueller investigation. The "dossier" compiled by Christopher Steele (Steele dossier) on behalf of the Democratic National Committee (DNC) and the Hillary Clinton campaign formed an essential part of the Carter Page FISA application. Steele was a longtime FBI source who was paid over $160,000 by the DNC and Clinton campaign, via the law firm Perkins Coie and research firm Fusion GPS, to obtain derogatory information on Donald Trump's ties to Russia. a) Neither the initial application in October 2016, nor any of the renewals, disclose or reference the role of the DNC, Clinton campaign, or any party/campaign in funding Steele's efforts, even though the political origins of the Steele dossier were then known to senior DOJ and FBI officials. The section above also makes a good case for releasing the underlying FISA application, as either the Clinton connection was disclosed or it wasn't - not a fact either party can distort. In a curious twist, in order to corroborate the dossier, the memo reveals that the FBI "extensively" cited a news article -- that was based entirely on the dossier. In effect, using the dossier to corroborate the dossier. The Carter Page FISA application also cited extensively a September 23, 2016, Yahoo News article by Michael Isikoff, which focuses on Page's July 2016 trip to Moscow. This article does not corroborate the Steele dossier because it is derived from information leaked by Steele himself to Yahoo News. The Page FISA application incorrectly assesses that Steele did not directly provide information to Yahoo News. Steele has admitted in British court filings that he met with Yahoo News—and several other outlets—in September 2016 at the direction of Fusion GPS. Perkins Coie was aware of Steele's initial media contacts because they hosted at least one meeting in Washington D.C. in 2016 with Steele and Fusion GPS where this matter was discussed. Steele's numerous encounters with the media violated the cardinal rule of source handling—maintaining confidentiality—and demonstrated that Steele had become a less than reliable source for the FBI. 3) Before and after Steele was terminated as a source, he maintained contact with DOJ via then-Associate Deputy Attorney General Bruce Ohr, a senior DOJ official who worked closely with Deputy Attorneys General Yates and later Rosenstein. Shortly after the election, the FBI began interviewing Ohr, documenting his communications with Steele. For example, in September 2016, Steele admitted to Ohr his feelings against then-candidate Trump when Steele said he "was desperate that Donald Trump not get elected and was passionate about him not being president." This clear evidence of Steele's bias was recorded by Ohr at the time and subsequently in official FBI files—but not reflected in any of the Page FISA applications. During this same time period, Ohr's wife was employed by Fusion GPS to assist in the cultivation of opposition research on Trump. Ohr later provided the FBI with all of his wife's opposition research, paid for by the DNC and Clinton campaign via Fusion GPS. The Ohrs' relationship with Steele and Fusion GPS was inexplicably concealed from the FISC. After Steele was terminated, a source validation report conducted by an independent unit within FBI assessed Steele's reporting as only minimally corroborated. Yet, in early January 2017, Director Comey briefed President-elect Trump on a summary of the Steele dossier, even though it was - according to his June 2017 testimony - "salacious and unverified." While the FISA application relied on Steele's past record of credible reporting on other unrelated matters, it ignored or concealed his anti-Trump financial and ideological motivations. Furthermore, Deputy Director McCabe testified before the Committee in December 2017 that no surveillance warrant would have been sought from the FISC without the Steele dossier information. The Page FISA application also mentions information regarding fellow Trump campaign advisor George Papadopoulos, but there is no evidence of any cooperation or conspiracy between Page and Papadopoulos. The Papadopoulos information triggered the opening of an FBI counterintelligence investigation in late July 2016 by FBI agent Pete Strzok. Strzok was reassigned by the Special Counsel's Office to FBI Human Resources for improper text messages with his mistress, FBI Attorney Lisa Page (no known relation to Carter Page), where they both demonstrated a clear bias against Trump and in favor of Clinton, whom Strzok had also investigated. The Strzok/Lisa Page texts also reflect extensive discussions about the investigation, orchestrating leaks to the media, and include a meeting with Deputy Director McCabe to discuss an "insurance" policy against President Trump's election. The bottom line: as noted earlier, if found that there was clear undisclosed bias in the launch of surveillance of Trump's team, then Mueller's probe - whose findings would be the result of a flawed FISA warrant - would be null and void, leave space for Trump to fire the special prosecutor or Rod Rosenstein. “I think it’s a disgrace,” Trump said of the alleged bias. "A lot of people should be ashamed of themselves." 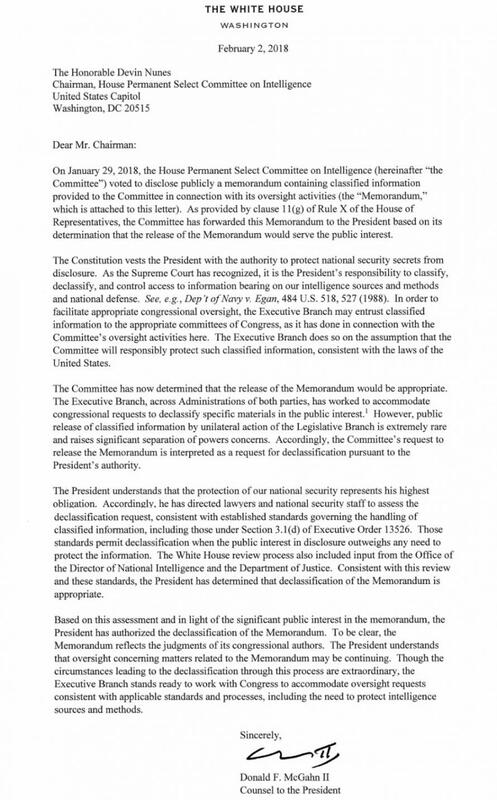 Just before noon on Friday, the "FISA" memo compiled by House Intelligence Committee staff, led by chairman Devin Nunes (R-Calif.), from classified documents provided by the Department of Justice, was officially declassified by Trump's lawyer Donald Gahn - over the objections of the DOJ and the FBI - as explained in the letter below. According to the Washington Examiner's Byron York who had access to an early released version, a key point in the memo is that the "salacious and unverified" Steele dossier formed the essential part of the initial and all three renewal applications against Carter Page, in line with what as previously leaked. York also notes that DOJ official Bruce Ohr was relayed information about Christopher Steele's bias. Steele told Ohr that he, Steele, was desperate that Donald Trump not get elected president and was passionate about him not becoming president. As a reminder, the FBI and Justice Department mounted a months-long effort to keep the information outlined in the memo out of the House Intelligence Committee's hands. Only the threat of contempt charges and other forms of pressure forced the FBI and Justice to give up the material.